GREENVILLE, S.C.— Ten at the Top (TATT) has announced the speakers for A Cleaner Future: A Look at Air Quality, Sustainability & Energy Innovation in the Upstate Workshop, which will be held on August 17 from 10 a.m. until 1:30 p.m. at the TD Convention Center. This event will focus on how innovation and technology is helping individuals, businesses, institutions and governments enhance air quality and environmental sustainability whether it be in the home, while traveling or in the business setting. Although the popular baseball series moved from Bangor, Maine to Easley just last year, the city is no stranger to the big stage. 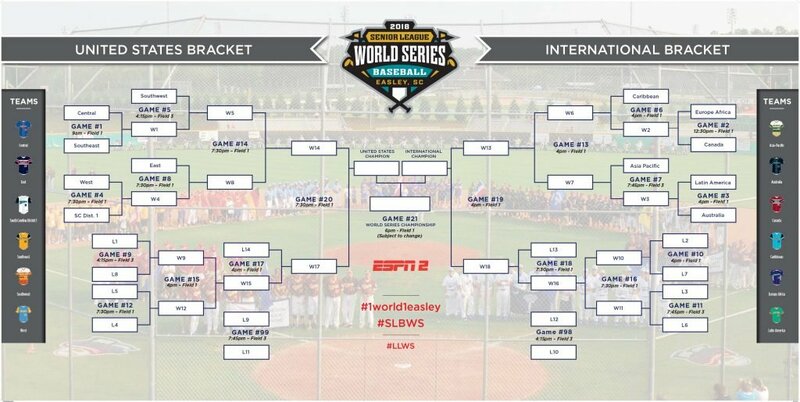 From 2001 to 2016, Easley was the destination of the Big League World Series (BLWS), which was discontinued following the conclusion of the 2016 tournament. A team from South Carolina won the BLWS title as recently as 2013. The SLBWS invites 12 teams, differing from its predecessor, which hosted 11. Click the image below to view this year’s bracket. The 2018 SLBWS, as years past, will be held at the J.B. “Red” Owens Sports Complex. There will be a Fan Fest held on July 27th in downtown Easley beginning at 6:30 p.m. The Fan Fest will include team introductions, family fun, and entertainment featuring Jack N’ Diane’s Dueling Pianos. It seems like only a short time has passed since we were wrapping up 2017 and making plans for approaching 2018, yet in seemingly a blink of an eye six months have passed and I am now reflecting on what has transpired so far in 2018 and what is yet to accomplish over the next six months and beyond. 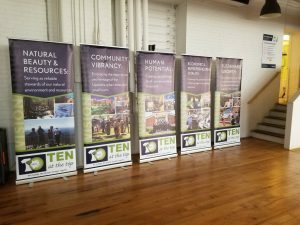 Ten at the Top began 2018 with a determined effort to maximize our limited staff resources to focus on collaborative capacity building regional initiatives that support our mission of enhancing economic vitality and quality of life in the Upstate. As part of that strategy, we moved fundraising and marketing from a full-time staff position to an agency contract and made the focus of both of our full-time staff members other than myself to be around program and initiative management. If the first six months are any indication, those moves were the correct decisions. Unlike many similar organizations, TATT receives very little government funding and are not a membership driven organization. This approach has been critical to TATT’s success as we annually have more than 400 organizations and businesses from across the region with representatives on our committees and engaged in our capacity building efforts without the barrier of having to make a financial commitment. Therefore, our financial support is much more dependent on individual businesses and organizations who believe in our mission and regional value and that are committed to be engaged not only in our regional efforts, but also in financially supporting TATT. Through the efforts of our Fundraising Committee, staff and fundraising consultant, we have raised more funds (nearly $340,000) during the first half of 2018 than in any similar period since the organization started in 2009. However, with an expanded budget for 2018 of $500,000, we are still working to engage more partners and support over the coming weeks. In addition, Our Fundraising Committee is taking a very active role in working to build long-term sustainable funding that keeps TATT able to focus primarily on our mission. In terms of meetings, presentations, events and other regional capacity building initiatives, the first half of 2018 has also been among our busiest with 58 regional engagements and 2,099 total participants. 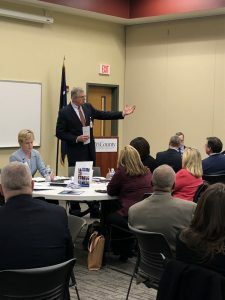 During the first half of 2018, Ten at the Top hosted the first-ever meeting of Upstate K-12 Public School Superintendents and College/University Presidents and Provosts. This initial meeting has led to the identification of some specific opportunities for greater collaboration among educators as well as the business community and a second meeting is now scheduled for September. In addition, there have been several meetings of the Advisory and Technical Committees as they work to develop a regional vision and actionable strategies for the Connecting our Future Mobility & Connectivity initiative. The results of this work will be rolled out during a regional event on August 7th. 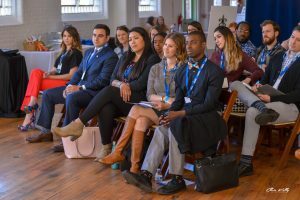 In March, TATT held the third annual PIQUE: Young Leaders Summit that connected 275 young professionals and business/community leaders from across the region. As we move into the second half of 2018, Ten at the Top will be hosting several additional large regional events. On August 17th TATT and the Upstate Air Quality Advisory Committee will be holding a regional workshop called A Cleaner Future: A Look at Air Quality, Sustainability & Energy Innovation in the Upstate. Since 2014, TATT has hosted a semi-annual regional summit focused around key issues facing the Upstate. The 2018 Summit: Winning the Future, will be held on September 25th and we are again expecting more than 800 stakeholders from across the region to participate in the half-day event. The keynote speaker is a nationally recognized author and business consultant Polly LaBarre. We also have several great breakout sessions focused around the question of what the region needs to do to be positioned for “Winning the Future” in relation to a number of key issue areas. As we have done annually since 2012, TATT will conclude the year with our Celebrating Successes – Great Things Happening Across the Upstate event. This brunch will include the recognition of companies and organizations celebrating milestone anniversaries in 2018 as well as the awarding of the 2018 Hughes Investments Elevating Upstate Community Vibrancy Grants. By multiple measurements, the first half of 2018 has been quite successful for Ten at the Top and our mission of fostering collaboration and partnerships across the Upstate. Yet, we know that working collaboratively and strategically on key regional issues is a marathon, not a sprint. While we acknowledge and appreciate the many partners and great work that has occurred so far this year, we must consider this work as building blocks for ongoing efforts to grow the Upstate’s collective capacity. I personally want to thank everyone who has been involved with TATT so far this year, whether as a funding partner, board or committee member or participant in some of our regional initiatives. You are critical not just to the success of Ten at the Top, but also of the Upstate region. I look forward to working with you moving forward on collaborative efforts to ensure that the Upstate continues to be recognized as a leading place to live, learn, do business and raise a family. “I encourage all of our region’s leaders to attend the Upstate Regional Summit. Historically, the Summit has been a much-valued opportunity to come together and collectively discuss the opportunities before us as well as the unique challenges we face as a 10-county region – from economic development to quality of life,” Sue Schneider, board chair of Ten at the Top, said. The 2018 Upstate Regional Summit will provide a unique opportunity for business, community and civic leaders, as well as interested stakeholders from across the region to share ideas and discuss how to work collaboratively to ensure the Upstate region continues to enhance the economic vitality and quality of life for all residents. Due to past demand generating a sell-out event in both 2014 and 2016 (the event is held every other year), Ten at the Top encourages organizations and individuals with a desire to register early. Seating at the Summit is limited, so to guarantee tickets, Ten at the Top is encouraging companies to purchase a table for 10 as a Table Sponsor. The sponsorship deadline is July 20 to be included in the Summit’s major print promotional materials. Table sponsorships can also be purchased through the TATT website. • Winning the Future: Creating Vibrant Communities. Located near the breakout sessions, new this year, the Summit will also feature Connections Corner, sponsored by GSA Business and Limestone College, where guests can speak with Upstate Leaders on variety of topics in a more personal and casual environment. Amy Wood, Emmy award-winning interactive news anchor for WSPA will be emceeing the 2018 Summit. The Summit will culminate with a seated luncheon featuring keynote speaker Polly LaBarre. Ms. LaBarre is the co-author of Mavericks at Work, co-founder of Management Lab (MLab) and founding writer at Fast Company. For more than 20 years, LaBarre has used her writing, business consulting, and speaking to help organizations unleash and organize human potential in ever more powerful ways. The 2016 Upstate Regional Summit brought together more than 850 business, community and civic leaders from across the Upstate in a sold-out event sponsored by more than 70 organizations to discuss key issues impacting current and future growth and the importance of regional collaboration. Ten at the Top expects the 2018 Upstate Regional Summit to draw a similarly large attendance, participation and support among Upstate leadership. Sponsorship opportunities are available for the 2018 Regional Summit. A table for ten at the Summit is available for $750. A table for ten with added exposure in the Summit’s networking expo is available for $1,250. There are additional exclusive sponsorships available at various pricing levels. All questions and inquiries regarding sponsorships can be directed to Caroline Gross at sponsor@tenatthetop.org or by calling 864-360-1015. Imagine a scenario where for significant parts of the year your family was unable to spend extended time outside enjoying parks, lakes and mountains like those we are blessed with here in the Upstate because the air was unsafe to breathe. Sound like something that could never happen here? Well, the reality is that prior to the passage of the Clean Air Act in 1970 there were many places across the entire United States where air pollution was at levels that made it difficult for people to safely spend extended periods outside. The Environmental Protection Agency (EPA) estimates that since 1970 the national emissions for the six primary air pollutants have declined by more than 70%. The EPA also estimates that because of the Clean Air Act more than 200,000 early deaths have been annually prevented in the U.S. and that the number of asthmatic episodes, cases of acute bronchitis and hospitalization due to breathing problems have been significantly reduced. However, even with all the strides that have been made, air pollutants can still negatively impact the public health. A new study conducted by researchers from the Washington University School of Medicine in St. Louis estimated that air pollutants play a role in more than 3.2 million new cases of diabetes annually (150,000 in the United States). Here in the Upstate, the American Lung Association (ALA) reports that there are more than 110,000 people in the region living with some form of Asthma, a number that has declined slightly in recent years, but still represents roughly 7.5% of Upstate residents. Because the Upstate is a manufacturing-focused economy, staying within EPA attainment levels is critical not just to the physical health of our residents, but also to the economic well-being of our region. If the Upstate were labeled a non-attainment area for air pollutants, the additional costs to our manufacturers would likely negatively impact their willingness to invest (or reinvest) in our region. Thanks in a large part to collaborative efforts by local governments, businesses and community organizations, our region has seen a significant reduction over the last two decades in overall air pollutant levels. Once annually within risk of being recognized as a non-attainment area by EPA and regularly receiving poor grades in the ALA’s annual ratings, the Upstate has seen a positive impact from a combination of primarily voluntary actions to reduce emission levels. When the most recent EPA ozone emission standards were announced in 2015, it marked the first time that the Upstate did not need any mitigation to ensure staying within attainment levels. In addition, the 2018 ALA air quality rankings gave every Upstate county an A or B for ozone emission levels (compared to primarily C and D ratings in 2012). Another component that has played an important role in reducing our air pollutants has been the continuing evolution of technology. The elimination of coal-fired electric plants in the region, the continued improvements in tail pipe emissions for vehicles and numerous other technology innovations have been critical to the reduction of air pollutants in the Upstate. Over the last several years, the Upstate Air Quality Advisory Committee, which includes local governments, businesses and non-profit organizations, has spearheaded the Clean Air Upstate campaign to help grow awareness of things that can be done by individuals, local governments and businesses to make our air cleaner and safer for everyone. On August 17th, the Air Quality Advisory Committee, Ten at the Top and presenting sponsor Bon Secours St. Francis Health System will be hosting a regional workshop called A Cleaner Future: Air Quality, Sustainability and Energy Innovation. The workshop will be held from 10 a.m. until 2 p.m. at the T.D. Convention Center. This informative and interactive workshop will feature keynote discussions and breakout sessions focused around innovations that are helping to improve air quality while in many cases also providing financial benefits for an individual, business or local government. After an opening session, attendees will self-select into the breakout sessions that best fit their interest: Home, Car/Travel or Business (each breakout session will be held twice to provide an opportunity to attend the two sessions of greatest interest). The workshop will conclude with lunch and a keynote program. If you are interested in learning more about how you can help continue to make the air we breathe in the Upstate safer through the use of emerging and innovative technologies, I hope you will plan to join us on August 17th. For more details and to register for A Cleaner Future: Air Quality, Sustainability and Energy Innovation Workshop, please go to our website at www.tenatthetop.org.